There are now so many top fitness trackers on the market that choosing the best can be difficult. It’s not a case of Fitbit or Jawbone or nothing. The right activity tracker will be based on your individual needs; whether it’s step counting, sleep tracking or 24/7 heart rate tracking, there’s something for everyone – it’s just about finding the right one for you. The choice is getting all the more difficult thanks to the added tech that’s coming in. From continuous heart rate monitoring like the tech that’s found on the Fitbit Charge HR to smartwatch style notifications, there’s a dizzying array of features to choose from. We’ve completely reworked our round up of the best fitness tracker to help guide you to your ideal band. While the Jawbone UP3 is still yet to arrive, the Fitbit Charge HR gets a stay of execution as the leader in our best fitness tracker list. By using continuous heart rate monitoring the Fitbit Charge HR can offer more accurate feedback on your activity and calorific burn than its rivals, and it comes in three handy sizes for different wrists. The OLED screen will show off your daily stats, as well as caller ID from your smartphone, and the app is brilliant for beginners and communities. Again with the continuous heart rate, the Fitbit Surge is built for multi-sports. As well as the usual running and cycling, the Surge is also great for the gym, enabling you to track static cardio workouts that are the foil of most movement-based trackers. Not only that, but the full OLED screen will display calls, texts and notifications in full, making this a true fitness super watch. On the surface the Orbit is an activity tracker, which uses built-in sensors to keep tabs on your steps, sleep and calories burned, like any other band. However, there’s more here than meets the eye. The band will pair with the Runtastic app to display the information from your run, right on your wrist. It’s a neat expansion of the common activity tracker, which can be annoyingly limited for runners and more prolific exercisers. This every day sports wearable blends fitness and sports features with reliable notifications in a reasonably priced package. It’s not exactly a looker but don’t let that put you off, the Vivoactive has GPS to accurately track running, cycling and swimming with live pace and distances. It’s not perfect – the screen is dull and the sleep tracking is awful – but as an easy to live with sports companion with access to Garmin Connect, this is a brilliant buy. Aside from our overall best fitness tracker the Fitbit Charge HR, our alternative pick for continuous heart rate monitoring is the Basis Peak. The Charge HR might be more useful and simple to read but the Peak is more accurate. The watch will auto-detect when you’re running and spit out some detailed heart rate information on your sessions into the web app, and enable you to monitor your vitals while you’re pounding the pavements. Lack of GPS is an issue, but the Basis Peak is still a strong companion. We’ve had a lot of questions about swimming compatible fitness trackers as not all the most popular devices are waterproof. Our pick is the Garmin Swimwhich offers great monitoring of your pool performance – number of strokes, stroke type, distance covered – with 5 ATM protection. More casual swimmer should check out the cheaper Misfit Shine which is also waterproof to 50m. If swimming is important to you, then check out our round up of the best waterproof fitness trackers. A new addition from CES 2015, the Swarovski Shine could be the ultimate lady’s fitness tracker. Hidden behind the Swarovksi crystal are all the tracking smarts you could ask for, and there’s a range of accessories from bracelets to necklaces. The tracker comes with a sports strap too as standard, to track running, cycling and swimming too. Later in the year will come a solar powered version, offering infinite battery life, and the purple colour you can see above. 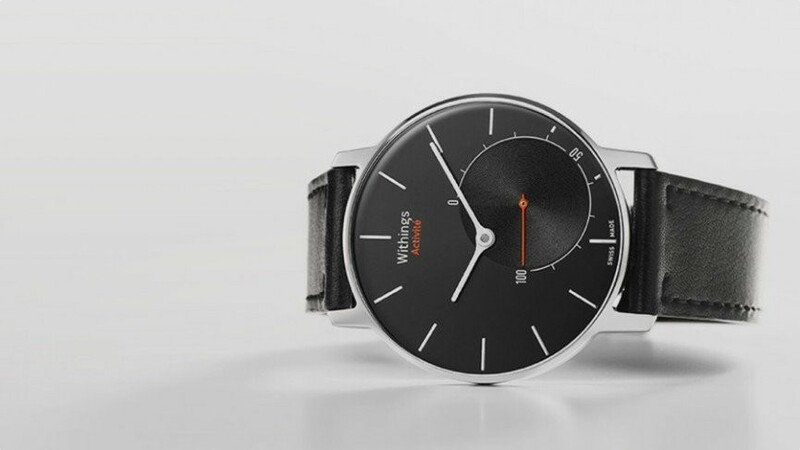 Leading the style stakes is a double header of Withings tech, which easily gets the title of most stylish fitness tracker – for men at least. The Withings Activité is the jewel in the wearable crown, packing step counting, distance checking and sleep tracking into a Swiss made analogue watch, that looks frankly glorious. It even comes with a sports strap for the pool, making it as adept for workouts as it is in the boardroom. If you don’t fancy splashing out in excess of three hundred notes for a tracker, the Withings Activité Pop could be the answer to your prayers. Packing the same smarts as its big brother, plastic replaces metal and China replaces Switzerland for this bargain tracker that will turn heads for all the right reasons. The Misfit Shine has some of the best sleep tracking in the business, providing excellent detail on your nightly deep, light and REM cycles. All importantly, the Shine automatically knows when you’re asleep so there’s no missed data, and the low profile means it’s comfortable to wear at night, maximizing its effectiveness. As well as being our top tracker for sports, the Vivoactive is also the best for notifications. Yes, it’s a smartwatch/fitness tracker hybrid but that works in its favour, not against it. Calls, texts, emails, social media, Uber alerts – anything that’s happening on your smartphone will appear on the Vivoactive. They disappear after 10 seconds and are stored for you to scroll through any you’ve missed too. The Garmin Vivosmart, the Vivofit’s natural successor, offers users a combo of smartwatch and activity tracking features in one slick device packing a nice, curved OLED display. It’s got all the same fitness features of the Vivofit plus the kind of notifications you’d expect from a smartwatch too. The alerts come by way of vibrations in the wrist and you’ll see an overview of what’s happening on the OLED screen. Placed somewhere between a fitness tracker and a smartwatch is the Sony SmartBand Talk . Its core intended purpose is as an activity device with sensors, like an accelerometer and altimeter, which are used to track your runs, walks and climbs. There’s a battery-saving 1.4-inch E Paper display and built-in voice controls which means you can make calls by talking into the band if you really want to. There are lots of nice colour options and you can use the Sony Lifelog app on Android to collate all of your data. For a $49.99 tracker, the Jawbone UP Move is extremely adept when it comes to sports. A tap of the button will set it into a dedicated tracking mode, which you can later assign to a dizzying list of sports from running to yoga and Zumba. While not hugely insightful, tagging enables fitness fans to keep track of their workouts, and get better representations of their calorific burn in the Jawbone app, which is coincidentally one of the best in the business. While the Jawbone UP Move we’ve already highlighted is a superb budget fitness band, so is its rival the Misfit Flash. Packing the exact same tech as the more expensive Misfit Shine/Swarovski Shine, the plastic Flash tracks steps, sleep and swims extraordinarily well and comes in a vibrant array of colours to suit all tastes. Another CES 2015 debutant, the Razer Nabu X discards the screen to offer sleep and step tracking at a fraction of the price. The really interesting part is the app store, and third party features include being able to trade Steam contacts with other gamers you meet. There are also basic notifications, and you can customize the three LEDs that make up the Nabu X’s interface to flash different colours for different types of alert. It’s not really made it out of China yet, but the Mi Band is a superbly built and wonderfully capable band, with an astonishing price. At just $13 Xiaomi has shifted over a million of its bands in China alone, possibly making this the ultimate fitness tracker. Another innovative tracker, Pivotal Living uses a subscription model for $12 a year, for all the standard steps and sleep tracking. It may sound crazy, but it means you will regularly get new features and hardware as they’re released, and it will take you years to tot up to the total of a Fitbit or Jawbone. When it comes to the full ecosystem of connected self products, Withings has it wrapped up. As well as the Activité and Pulse wearable devices that all monitor steps and sleep, it also has connected smart bathroom scales, blood pressure monitor and a detailed sleep sensor that all feed into the same Withings Healthmate app. With all this detail in one place, it provides the best picture of your overall health. A good value price, compatibility with brilliant food app MyFitnessPal and the power of Garmin’s Connect community make the Vivofit 2 a nice choice for those looking to shift the pounds. The Move bar will also remind you to get up and move around every hour or so plus step goals are based on your recent activity, it’s not a one size fits all approach here. Most fitness trackers are fairly easy to use, but few are a fuss free as the Acer Liquid Leap. All your step, sleep and goal information is displayed on the screen, meaning you don’t have to even open the app if that’s beyond your comfort level. If you do, everything’s well laid out, with simple graphs showing your improvement over time. This entry was posted in Fitness, Training by taseeger. Bookmark the permalink.